Cecil Williams, who is blind, left his home with his guide dog Orlando on a trip to the dentist. Williams began to feel faint while standing on a Manhattan subway platform and Orlando, a black lab, tried to prop Williams back up. "He tried to hold me up," the emotional Williams told the Associated Press from his hospital bed, his voice breaking at times. Williams lost consciousness and tumbled in front of an oncoming train. According to witnesses Orlando barked loudly when he saw his owner on the tracks. When Williams didn't move, Orlando dove down onto the tracks beside his owner and began nudging his face to get him to move. With no movement from Williams, Orlando stood beside his owner and faced the train. Miraculously both Williams and Orlando escaped serious injury when the train passed over top of them as witnesses called for help and the train's motorman slowed his approach, AP reports. 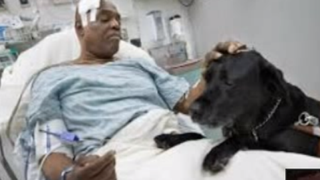 "The dog saved my life," Williams said. Once Williams came to, he heard someone tell him to stay still. He was put on a stretcher and pulled from the subway. Orlando was also checked and had no major injuries, AP reports. Williams, who has been blind since 1995, is still unclear as to why he lost consciousness but told AP that he is on insulin and other medications. Orlando will be rewarded with unlimited scratches behind the ears and a yet-to be determined treat. Williams says that Orlando is serious but laid-back, and the lifesaving canine has been making new friends during their hospital stay. Williams and Orlando are both expected to make a full recovery. According to AP, Orlando is Williams' second dog, and since he is turning 11 on Jan. 5, he will be headed toward retirement. Williams' medical benefits will cover a new guide dog but won't pay for a nonworking dog, so he'll have to find a good home for Orlando. "If I had the money," Williams told AP, "I would definitely keep him." But Williams wouldn't let the impending separation between them hold him down. "I'm feeling amazed," Williams said. "I feel that God, the powers that be, have something in store for me. They didn't take me away this time. I'm here for a reason."